Memorial Boulevard Christian Church Food Pantry is located at 3000 North Kingshighway, St Louis, MO 63115 (314-367-6817). Memorial Blvd’s food outreach has been in existence since 1973 and is supported by several church and food relief organizations in St. Louis. They offer food, clothing and emergency assistance every Tuesday and Thursday between 2-4 p.m. A referral is needed for the 1st visit in a year. One may visit monthly. Volunteers to assist are always welcome! 1. 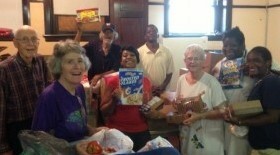 PRAY for all in St. Louis to have access to nutritious food. * Provide transportation and help stocking shelves during MBCC’s monthly food pick up from the St. Louis Area Food Bank. * Tend the WGCC tomato garden. * Contact Rev. Margie Pride for volunteer opportunities. Cash or Check: Make checks payable to WGCC and write “MBCC Food Pantry” in the memo line. Food: Place non-perishable food items & toiletries in the food box in the WGCC Tower Hallway.